Off to a very impressive start for a brand new model, the 2018 Range Rover Velar just won “Best Small Premium Utility Vehicle” in the Automobile Journalists Association of Canada’s 2018 Car and Truck of the Year awards program. A vehicle needs to be entirely new, redesigned or substantively refreshed to qualify for AJAC’s annual Car and Truck of the Year program, and the Velar is as entirely new as SUVs get. It was up against multiple entries that took part in AJAC’s annual Test Fest in the fall, plus two additional finalists announced in December, these including Porsche’s 2018 Macan and Volvo’s XC60. Earning top spot against such lofty competition must certainly sweeten the experience. Along with sleek new styling featuring trademark Range Rover design cues, the Velar’s interior is finished to a higher standard than most premium competitors. Rich hardwoods, leathers, and metals adorn the cabin, with impressive attention to detail. Even more alluring is its futuristic use of digital displays in top trims, from its fully configurable primary gauge cluster to its multi-tiered centre stack/console combination that comes filled with colourful, graphics, it’s one of the most advanced driving environments in the entire industry. All of this, together with four-cylinder turbo-diesel and gasoline-powered V6 powerplants, boasting standard fuel-economy of 8.5 L/100km combined city/highway and available supercharged performance that tops out at 380 horsepower, not to mention the brand’s legendary Terrain Response-enhanced four-wheel drive, nothing in the compact luxury SUV segment comes close to the Velar’s overall capability. The Velar wasn’t the only Jaguar Land Rover Canada vehicle to earn an award either, with the much-revered 2018 Jaguar F-Type sports car and more practical 2018 Jaguar XE four-door sport-luxury sedan winning “Best Premium Sports – Performance Car” and “Best Small Premium Car” respectively. This results in three category wins, which means Jaguar Land Rover was tied for most awards in this year’s program. Like the Range Rover Velar, the Jaguar XE was up against plenty of small luxury cars in the fall and two finalist of its own after AJAC pared down the entries in December, Alfa Romeo’s directly competitive 2018 Giulia sport-luxury sedan, which is an entirely new model, and Infiniti’s redesigned 2018 Q60 personal sports coupe. Likewise, the F-Type battled it out with two figurative heavyweights, Porsche’s redesigned and renamed 718 Boxster and Cayman, plus the refreshed 911. Once again, the individual strengths of these competitors also make Jaguar’s prize wins more rewarding. An honourable mention should go out to the new 2018 Discovery that achieved finalist status in the “Best Large Premium Utility Vehicle” category, having joined Volvo’s 2018 XC90 as runners-up against the refreshed 2018 Acura MDX. Of note, all Land Rover and Jaguar vehicles are mostly made from lightweight and recyclable aluminum, setting them apart from the majority of rivals. The new Range Rover Velar is sized similarly to Jaguar’s F-Pace and is also based on the same platform architecture, which means it’s a large compact SUV that borders on mid-size. The D-segment XE is Jaguar’s entry-level car, positioned below the mid-size E-segment XF and full-size XJ flagship sedan, while the F-Type sports coupe and convertible are the inspirations for the entire brand. Additionally, Jaguar Land Rover is one of the only manufacturers offering fuel-efficient turbo-diesel technology, the British automaker coming to market with its vigourously tested, globally approved Ingenium diesel line when others were under condemnation for less advanced diesel powertrains that didn’t live up to their “clean diesel” claims. JLR has also introduced a new gasoline-powered 2.5-litre Ingenium line of turbocharged, direct-injected four-cylinders this year, with the most potent producing 296 horsepower, while it continues to offer supercharged V6 engines up to 380 horsepower, and supercharged V8s up to 575 horsepower, depending on model. 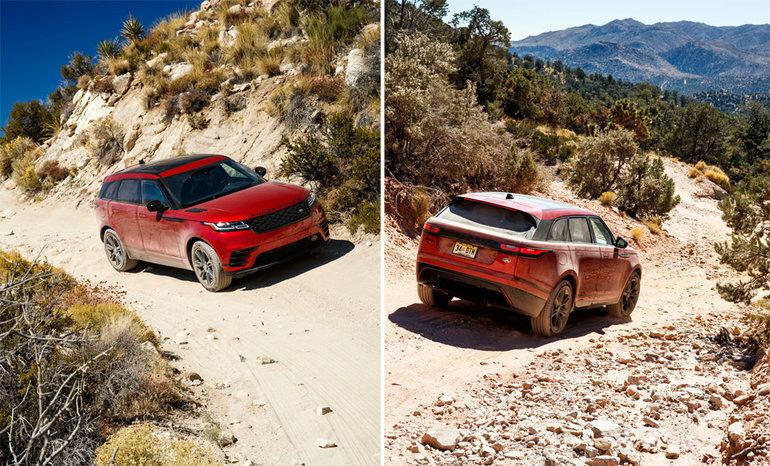 To find out more about the new 2018 Range Rover Velar or 2018 Land Rover Discovery, contact Land Rover Vancouver by phone at (604) 738-5577 or come visit the showroom at 1730 Burrard Street, Vancouver.